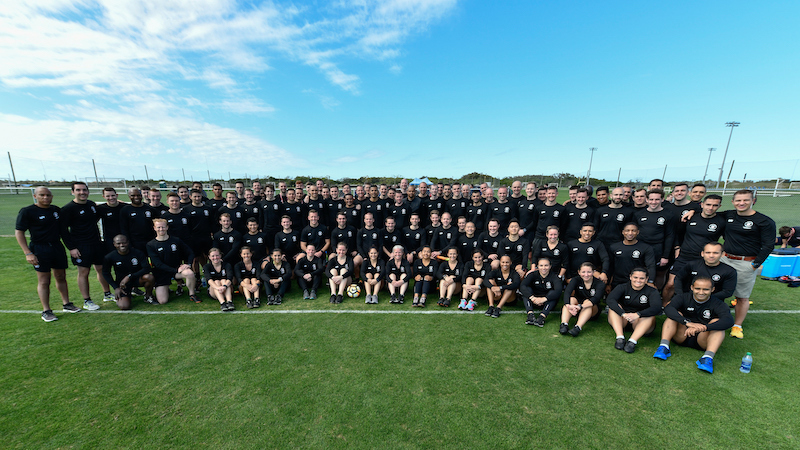 CHICAGO (Jan. 24, 2019)—The U.S. Soccer Referee Program named this year’s 83 National Referees earlier this month at the Federation’s annual National Camp in Bradenton, Fla. from Jan. 10-13. The National Referee certification is the highest level licensed directly by U.S. Soccer. In addition, the Federation announced 122 former officials who will serve as national referee coaches in 2019. The 83 newly-minted National Referees are eligible to officiate professional matches across the United States, including Major League Soccer, the United Soccer League, and the National Women’s Soccer League. The certification is one step below the world’s highest level, FIFA, which allows referees to officiate international matches and FIFA competitions. At the Referee Program’s National Camp, National Referee candidates go through rigorous physical testing, extensive classroom work, video analyses and practical field sessions. The referees that earned their national badge this month started at the grassroots level, working youth games as Grade 9 or 8 officials. At Grade 7, referees can start to officiate adult soccer before progressing to become Grade 6 State Referees. National Referees are certified from the national pool of Grade 5 State Referees. Referee coaches are former officials that work to build the future of the Referee Program by helping to educate and guide the next generation of referees. Selected by the U.S. Soccer Referee Program, referee coaches will evaluate and coach officials in games at elite regional and national events across the country in 2019. © Kentucky Soccer Referee Association. All rights reserved.